KKK 6 Horror week special and 4th Episode begins with Ashish and Hussain having a fun banter with Natalia and they tell her to tell Rohit as Khadoos, Khatarnak [cutter naag], Jallad [adorable guy]. She agrees to say those words to Rohit. For the 1st Stunt, Siddharth reveals the ordering of contestants by swimming to the boat – Riddhi, Rakesh and Ashish. Natalia speaks to Rohit that he is Khadoos, Khatarnak and Jallad. Rohit understands it is Ashish and Hussian who has taught her and they all have laugh. The contestant will hanging upside down tied to helicopter and they need to fetch the flags from a square set-up in water and there are two such places. Afterwards, they will be flown to some place in air where they need to unlock themselves and dive in the water. Finally, they need to swim in the water with flags and deposit those flags in a box at the shore. The one collecting the least no of flags will get a fear funda. The ordering of who will go first was decided by Ashish, Riddhi and Rakesh extracting the key from a bowl with egg liquid from Ostrich. Rohit settles the score with Ashish regarding the earlier matter with Natalia. He applied more force on Ashish’s head when his face was under that egg liquid bowl. He starts his stunt and plucks some buoys/flags from the first square area. He collects some flags from both square places and gets hold of them tightly. He unlocks one of his harnace attached and finally unlocks himself fully. He swims and comes to the shore and puts those flags in the box completing his stunt. He has put much strengths and also uses his hand well to keep those flags with him. * Rakesh is the captain of Indian Kabbadi Team. Ashish starts his stunt and retrieves some flags but drops a couple. In the second attempt, the harnace cable gets removed while he was fetching the flags. He is taken to the aerial place while he is one leg tied to helicopter. He unlocks his harnace to dive in water with flags and completes his remaining stunt. She wants to take as many flags as possible. She starts her stunt by collecting few flags at the onset and keeps all of them very close to her. She reaches a place where she needs to dislock or unlock her harnace. First she drops down all the flags to unlock herself and then swims to reach the shore with them. She completes her stunt and speaks of taking care of flags as the baby after her performance. Result: Ashish has extracted 24 flags, Rakesh – 22 flags and Riddhi – 25 flags. Rohit reminds that Riddhi has dropped 5 flags otherwise the count would be higher. Rakesh gets the danger band and will participate in the elimination round. The contestant has to drive the car and at some high speed drive it on the ramp and move ahead to break 2 sets of glass sheets. After doing so, they need to apply brakes and stop the car before a mirror which is placed at some distance. Moreover, the soil is slippery. The ordering of contestants is decided by the one who first removes the tyre from the car. Hussain extracts the first tyre and he then decides the ordering – Chang, himself and finally Iqbal. He starts his stunt and drives the car at some good speed to approach the ramp and breaks two sheet of glasses in quick succession. He tries to put brakes but was unable to stop it and goes on to break the mirror thereby not completing his stunt since the car was supposed to be stopped at some distance before the mirror. He starts his stunt and breaks two sheet of glasses and manages to stop his car and doesn’t break the mirror. He stopped the car some 5.7 metres before the mirror. He starts his stunt with some slow start and gradually speeds up and breaks the first 2 glass sheets. He applies brake and manages to stop the car much before the mirror. He tells his daughter Amara to just watch and not do the stunt. He stopped the car some 7.1 metres before the mirror. Result: Meiyang gets the danger band. 5 contestants – Meiyang, Natalia, Sagarika, Harshad and Rakesh. They will battle it out and there will be one elimination. The contestants have to lie down in the coffin box and they will have two keys at their disposal. Their hands are binded with ropes. The contestants have to unlock the ropes first and then open 2 locks using the keys to open the lid of the coffin. Finally, they also need to pluck the flag while lying to complete the stunt. There will be 15,000 cockroaches [3 bowls of cockroaches] and 2,500 of them are from Magadascar. The stunt time is 8 mins and cannot be longer since doctors haven’t advised for more time. It is time-based stunt and the one taking more time will be eliminated. Ashish sings a song with contestants moving the danger band among themselves. Rohit stops Ashish’s singing and Sagarika has it. She then decide the ordering. Stunt time of contestants is revealed after all contestants gave their performance. The cockroaches are put over him at the onset. Rakesh opens his ropes quickly and uses the keys to open the locks quickly. He opens the lid and plucks the flag to complete the stunt. He took 51 seconds. He starts his stunt and quickly opens his ropes. He finds the keys and opens the first lock with some efforts and time. For the second lock, he takes some time and finally completes his stunt but felt bit distracted with cockroaches. He took 1 min 41 seconds. Meiyang quickly removes his ropes and takes some ime to open the first lock and completes his stunt very soon. He talks about focus and determination has diverted his attention from cockroaches. He took 32 seconds to complete the stunt. She opens the first lock in some time and quickly opens the second and completes her stunt. She took 43 seconds. 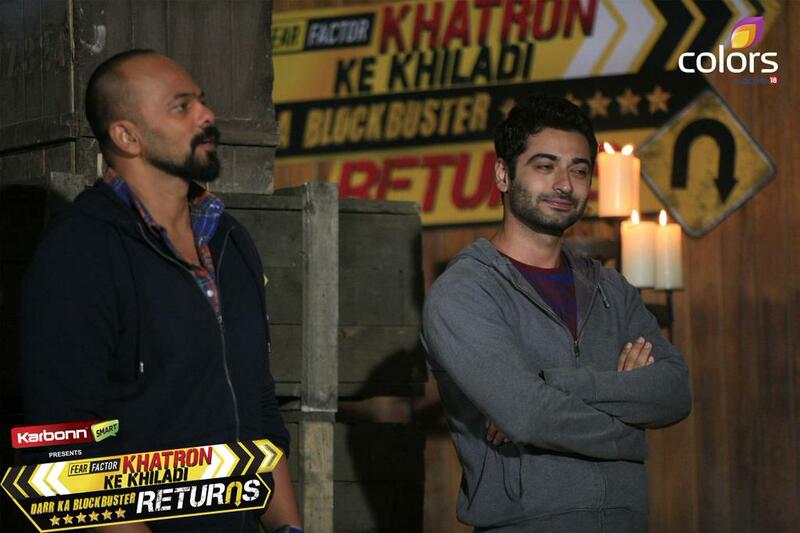 First Elimination Result: Rohit thinks that Harshad had a bad luck as he is eliminated from KKK 6. All other contestants give a goodbye hug to Harshad. Harshad thinks he has not done to his best and thus is going away..
Rohit tells the contestants to give their best and not just to save themselves since the best performer will have an advantage. and he will tell more about it in coming weeks. Rohit before signing off talks about facial massage and calls Sana and Siddharth. Some snails are put on their face. Next week: Filmy week. Ashish is seen enacting the role of Gabbar from Sholay. There is a Dhoom 3 stunt with the contestants walking on a wall and coming down while plucking flags on their way. There is a stunt with a Car and 100 snakes inside it. Moreover, water stunt is also there with underwater container with pathways and flags need to be extracted. It will again test their mind endurance and ability to overcome fear. Copyright © tellyreviews.com, 2015. All Rights Reserved. Unauthorized use and/or duplication of this material without express and written permission from tellyreviews.com is strictly prohibited. HAVE YOUR SAY @ TR !! Kumbhkaran to wreak mayhem in Ram’s camp and more….